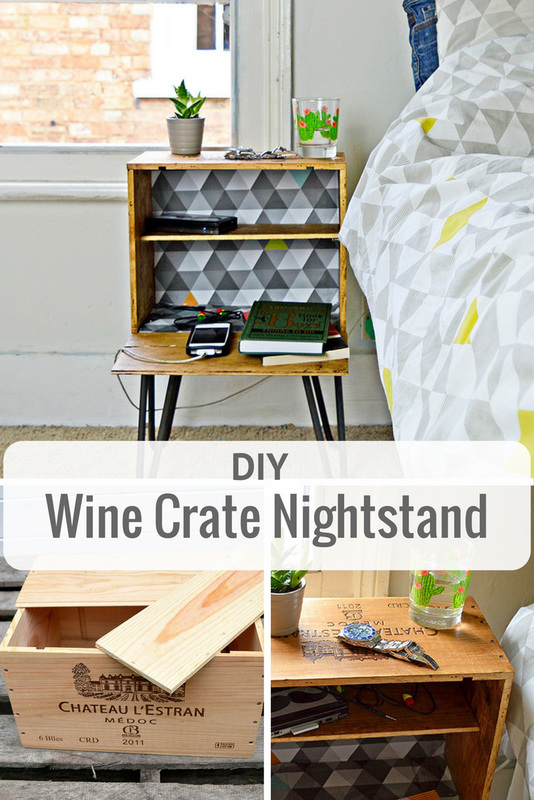 DIY Nightstand from an old wine crate. I revamped an old wine crate into a DIY nightstand for my son’s bedroom. Every year my aunt brings us back a crate of wine from France. 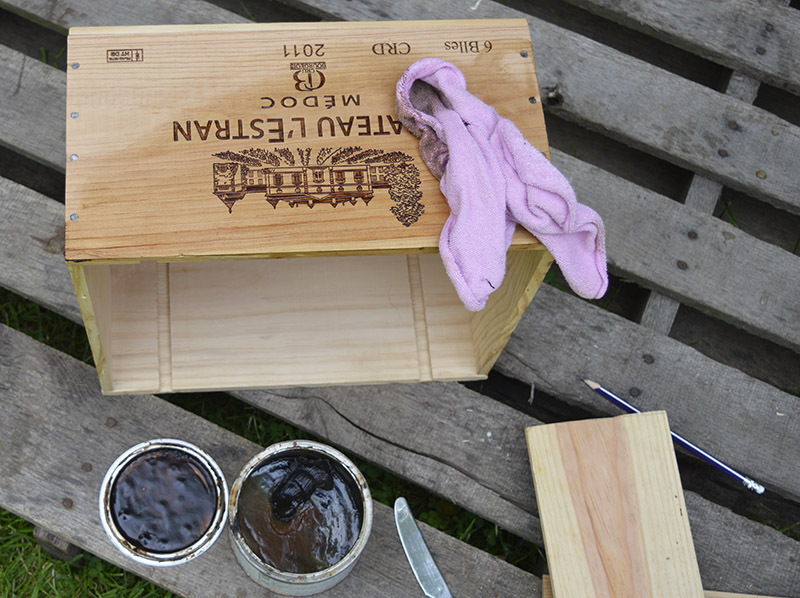 I love these little wooden crates almost as much as the wine but not quite! When my son was moaning that he didn’t have anywhere to put a glass of water at night I decided to DIY a nightstand using one of these crates. The nightstand looks awesome in my son’s room and he loves it. Now he’s got somewhere to put that glass of water, and a place to rest his phone as it charges overnight. Also there is room enough for the books he’s currently reading his tablet! 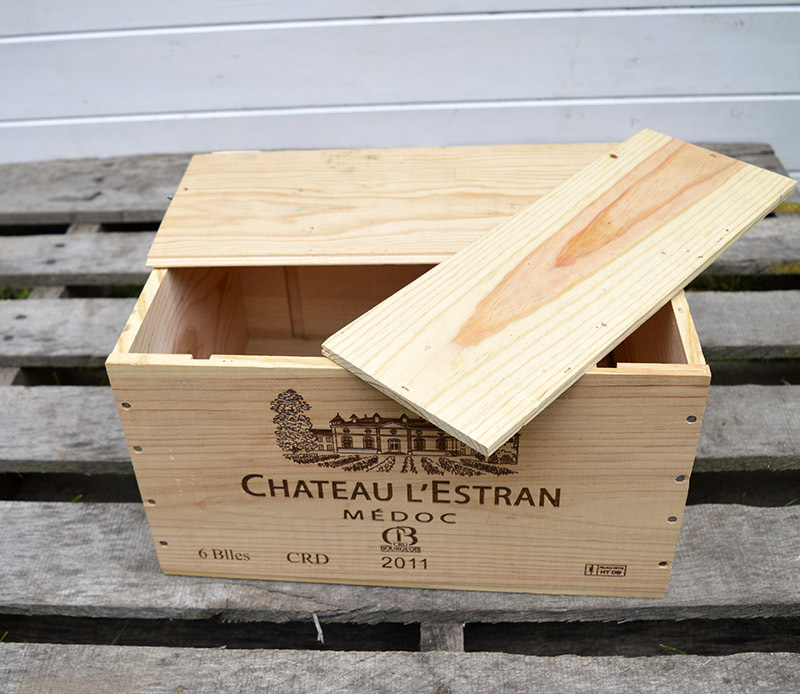 Wooden wine crate with lid – You normally get these when you buy half a dozen bottles of the same wine. You could ask your local wine merchant if they have any spare. Or you could buy a box of wine from Costco, drink it and then use the box. Hairpin table legs – I used 16″ legs. Short & wide wood screws to fit legs. 1. I wanted to maximize the usefulness of the DIY nightstand. Therefore I used the lid to make both a shelf and a lip. The lid came in two parts. 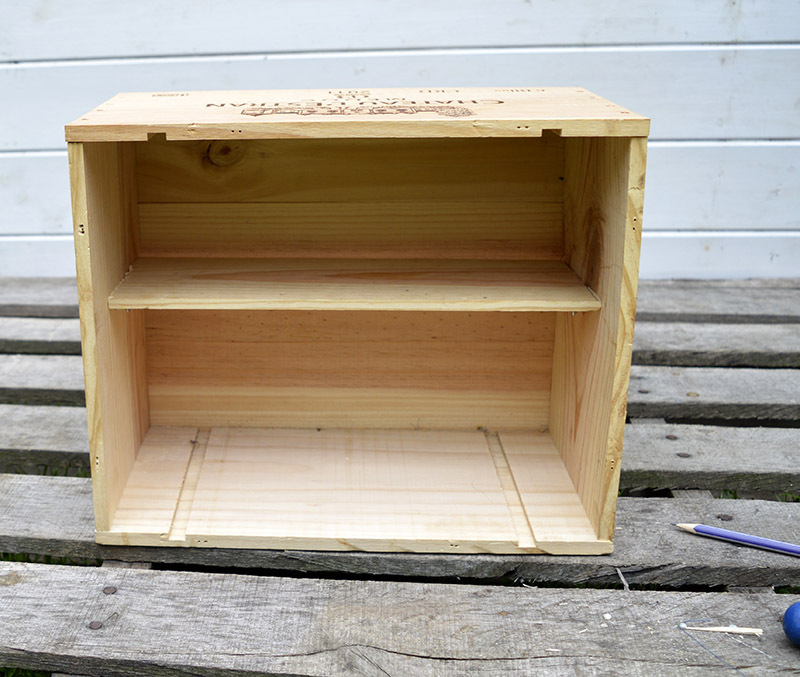 I sawed the end off one of the lid parts so that it would fit into the crate to make a shelf. To hold the shelf up I screwed in four wooden screws to rest it on. Since making this I have found picture eyelets are a great way to hold up shelves I did that with my upcycled drawers wall unit for my bathroom. 2. The wooden crate was a bit new looking. To give it that more aged and worn look, I simply covered it with dark polishing wax. I used a lint free cloth and simply rubbed the wax into the wood. When all surfaces had been covered I buffed them with a clean cloth. 3. To add further interest to the DIY nightstand I papered the inside of the wine create. I’d found a geometric wrapping paper that matched the bedding in my son’s room. I simply cut the wrapping paper to size and used mod podge to stick it to the crate. I also gave the top of the paper a coat of mod podge to seal it. This really added to the nightstand and made it look like it was meant for his room. 4. 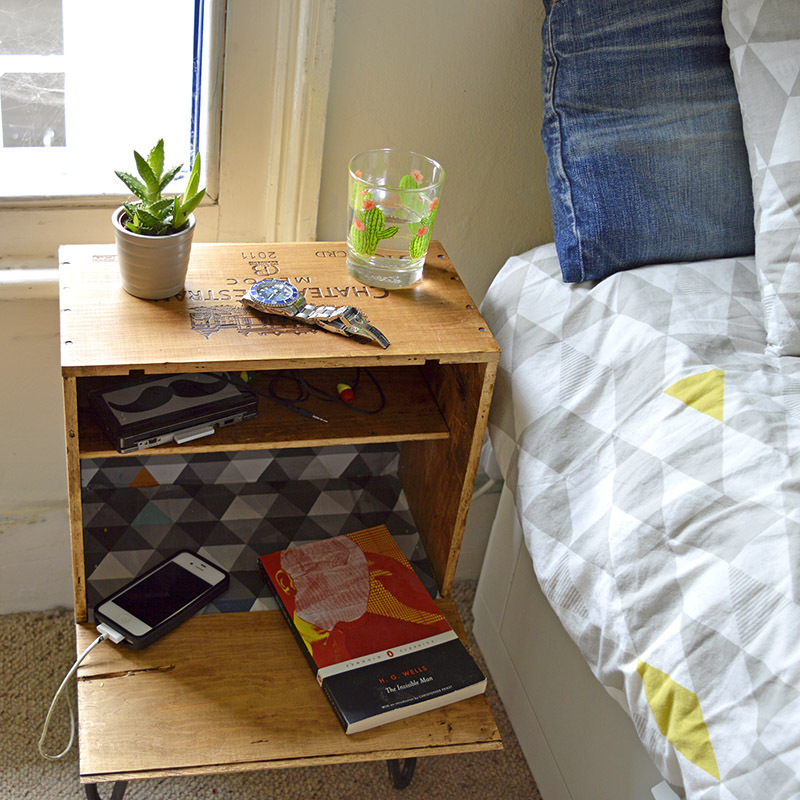 Lastly I added the hairpin legs to DIY nightstand. The back two legs were simply screwed onto the base of the wine crate. 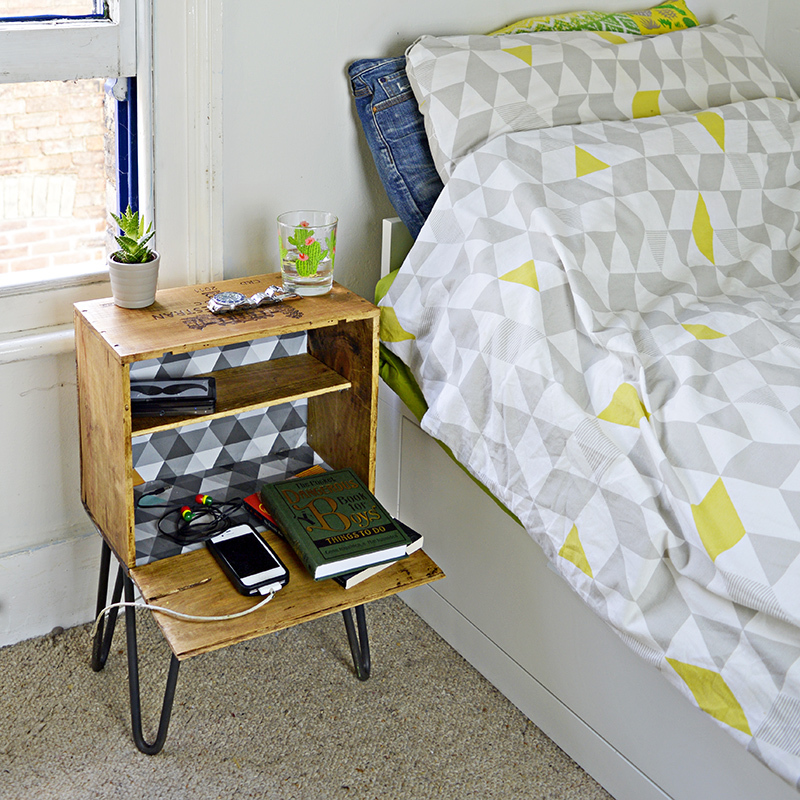 The front two legs were used to secure the lip of DIY nightstand. 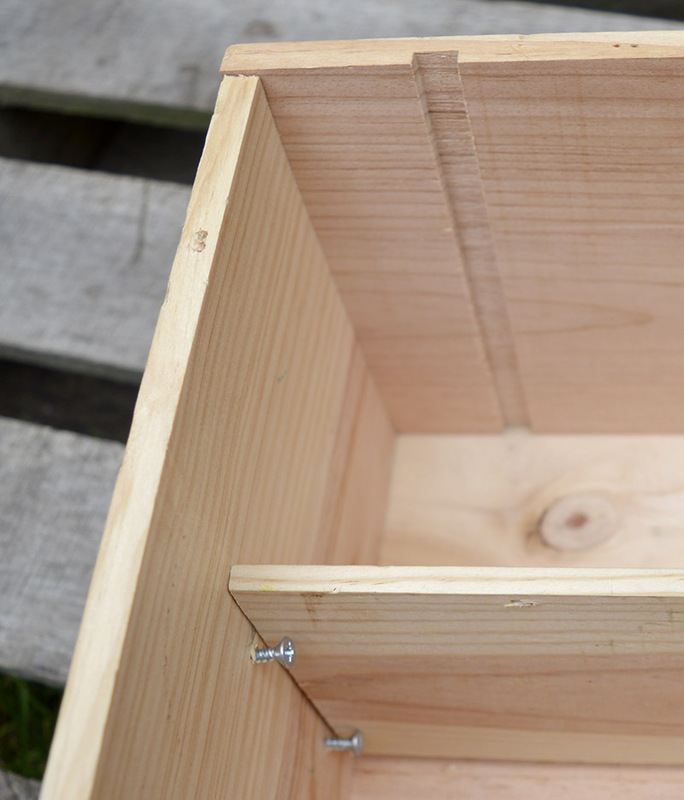 Half the legs brackets screwed into the base of the crate and the other half into the lip (made from the lid). This held the lid in place and created an extra shelf area for my son. 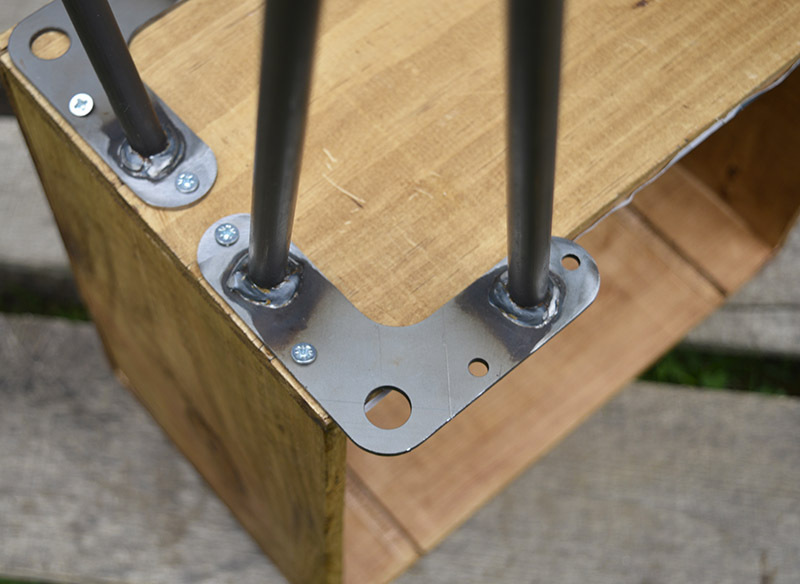 Hairpin legs are great for transforming loads of things like crates, pallets and suitcases into tables. They come in loads of different heights and colours which only adds further to your projects. I used some shorter hairpin legs to upcycle a vintage suitcase into a travel themed side table which you can see here. You might also want to check out my fantastic upcycle of a pair of jeans and wooden crate to create a nifty denim DIY ottoman with storage. This was actually an IKEA hack. I so appreciate this post and all of the pictures along with the detailed description of the process. I just have one question, how did you attach the lip to the front of the crate? I thought maybe I missed it but I went back and checked and couldn’t find it. Thanks again for sharing! Hi Rizzy sorry it wasn’t clearer but I attached the lip to the crate using the hairpin legs bracket. 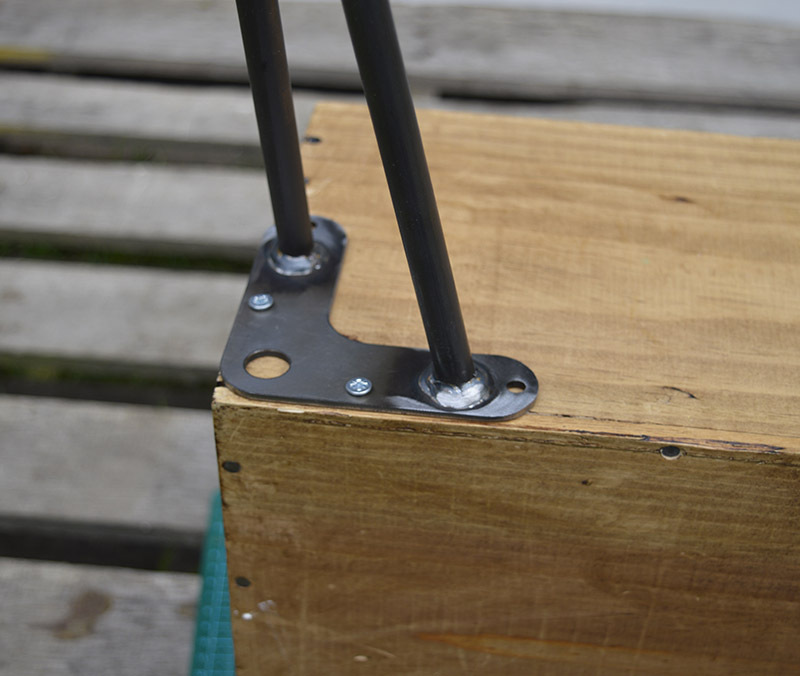 I overlapped the fixing bracket of the front hairpin legs so that half the screws went into the base of the crate and the other half into the lip. This has worked well as it’s still holding up well in my sons room. Thank you, I checked out your cabinet it looks fabulous. I love the geometric paper you chose. Looks beautiful! I saw a similar project that didn’t mention how the table was installed, and I appreciate the detailed plans/pictures. It’s a great idea and a gorgeous piece. Thanks, my son still loves it in his room. Thank you, I’ll check them out. How thoughtful of your aunt and how clever of you to repurpose those crates. Thanks for sharing at Celebrate Your Story. Thanks, yes I love receiving the wine and the boxes. This is an awesome idea! Such a great way to repurpose that neat crate (also, how amazing that your aunt brings you wine from France!). Thanks for sharing with our Merry Monday party this week! Thanks ! Yes I’m lucky about the wine, she’s in France at the moment so hopefully another box of wine will be on it’s way shortly. WOW!! this is just fantastic and so very creative!! I’ve chosen your wine box bed side table as my Friday Favorites Feature this week – thanks for linking up!! Thank you so much for picking my nightstand. Wow Claire!! This wine crate nightstand looks awesome!! Love that you were able to repurpose the crate. I really like the print you added to it as well. I bet your son loves it! Thank you ! It was just luck when I came across the wrapping paper, I wasn’t even thinking of decoupaging the nightstand at that point. What a fun idea! I love the colors and patterns you used too. Thanks for linking up at Friday Favorites. I’m featuring you this week! Thank you very much and I look forward to seeing the feature. Wonderful project and so thrifty. Love you think! The legs are awesome! Thanks so much for sharing your creative project at DI&DI. Thanks ! Yeah I really like hairpin legs too. This project turned out so great! I just love the legs you used. The possibilities for those seem endless! Thank you for sharing on Family Joy Blog Link-Up Party. Have a great week! Thank you ! Good luck with your new night stands. What a fabulous transformation! Great idea and love how you have turned this into a unique nightstand!!! Thank you for sharing over at Waste Not Wednesday! Can’t wait to see what you share this week! Love the pattern you used for the background. Thank you for sharing with us at #HomeMattersParty . We would love to have you again next week. Thanks, the geometric shapes go well with the decor in my sons room. Thanks! I’m sure you could build it yourself it is easy. This looks great. I love how easy and cheap it was to make. Great job! Thanks for linking up at Dishing it and Digging it link party. We love having you. Thank you! I’m sure you could do it, it’s rather easy. What a great idea! 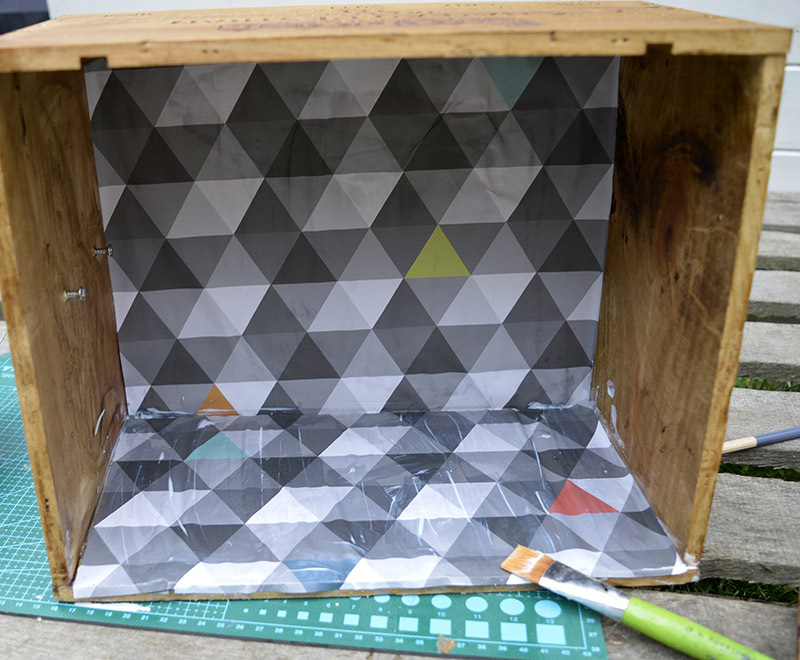 The wrapping paper is a great, budget-friendly alternative to wallpaper and it looks fantastic. Thanks for the inspiration! Thanks ! I couldn’t resist the wrapping paper when I found it as it went so well in his bedroom. Awesome! Your DIY project reminded me of how I used wine crates to store my CDs as a shelving unit in high school. Great to see someone else finding another purpose for these. Thank you ! My kids don’t have CD’s these days it’s all downloaded, but I bet they were great for that. Thank you, yeah I think the paper adds a bit of interest. What a cool night stand. I love it! Love that you repurposed a wine crate. Love the paper inside. You will have to fashion one for yourself, then you can place that glass of wine on top! Thank you, and I like your thinking. Really cool idea! I love using old crates, too — so this would be a fun project! Thank you ! Old crates are great for crafting. How clever this is. You have created quite the conversation piece and your son has a unique piece of furniture for his glass of water. I love this! So cute, especially with the paper inside. Thank you ! Yeah I do think the paper adds to it. Better go and buy myself a crate of wine! Whether I make this or not I think I still should pickup a grate! It’s always a good idea to buy a crate of wine, and now you’ve got a good excuse if you happen to need one ! I love this especially the geo style paper you used to. Your son is a lucky boy! Thanks Medina, yeah he likes the geo paper I think the geo look is a great one for teen bedrooms. that is so awesome, and i love the legs you chose to use. 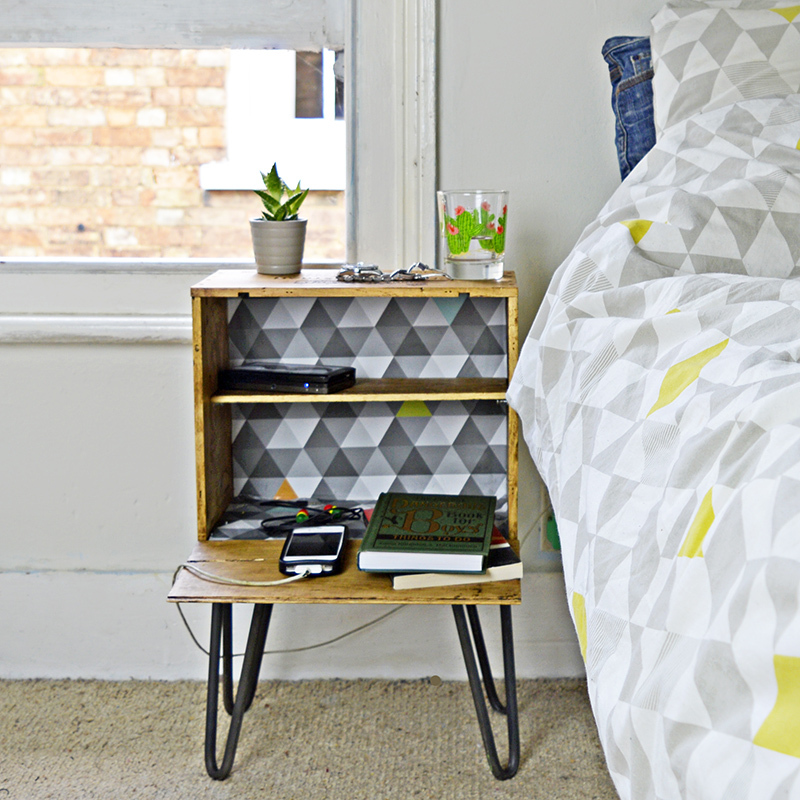 Claire, what a cool idea, your son must love this bedside table! I like the paper you mod podged inside the crate, it does really make it even cooler….now I really want to try something using hairpin legs, they look so great!!! Thanks ! Yes hairpin legs are great, this is the second time I’ve used them and I’m sure its not the last. Hi Claire, I’m Anne, and I’m visiting from the Thursday Favorite Things blog hop. I love your repurposed wine box! I’m big into repurposing myself, and love finding old boxes to turn into shelves and things. I haven’t done a nightstand, so now you’ve inspired me to try something new. Thanks! Anyway, have a wonderful day, and I hope you can pop over to my blog (https://birdsongbitsandpieces.blogspot.com) sometime to say hi! Thank you. Your blog looks great I like your door project. That turned out great! Such an in look too. Thanks so much for sharing this at Thoughts of Home on Thursday. Thank you so much. It does go well with his room. Thank you very much ! My son does love it. Very fun! We have a similar wine crate sitting in our garage just looking for a purpose. Love the pin legs. Visiting from Homemade and Handcrafted. Thank you Victoria. Maybe you should get some legs yourself.